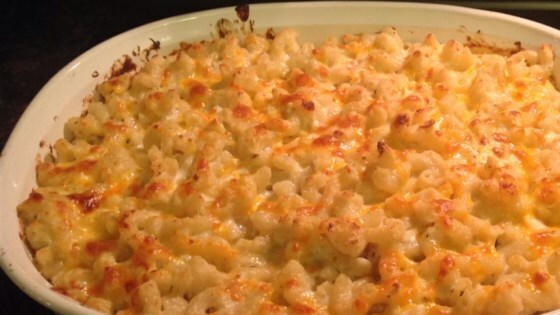 "A savory twist on traditional macaroni and cheese made with multiple cheeses for layers of cheese flavor in every bite." Preheat the oven to 400 degrees F (200 degrees C). Lightly grease a 9x13 inch baking dish. Bring a large pot of lightly salted water to a boil. Add macaroni, and cook until tender, 6 to 8 minutes. Drain. In a large bowl, toss together the mozzarella cheese, Swiss cheese, Parmesan cheese and Provolone cheese. Remove about 1/2 cup for topping and set aside. In a separate bowl, stir together the ricotta cheese, sour cream and heavy cream. Season with parsley, Italian seasoning and garlic salt. Bake in the preheated oven until cheese is melted, about 10 minutes, then turn the oven to broil. Broil for about 5 minutes to brown the top.